Bob Griese was a two-time All-American at Purdue and the Dolphins’ No. 1 draft choice in their second year as a franchise in 1967. He led the Dolphins to three AFC championships in 1971, 1972 and 1973 and victories in Super Bowls VII and VIII. Included in that was the perfect 1972 season. The 1972 Dolphins that Griese led are the only team in the history of the NFL to go undefeated and win a championship. In 14 seasons, Griese threw 3,429 passes, completing 1,926 for 25,092 yards, 192 touchdowns for a 77.1 career passing rating. He also rushed 261 times for 994 yards and seven touchdowns. 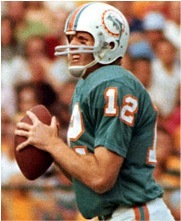 Griese was a six-time Dolphins MVP; he was named All-Pro in 1971 and 1977, and All-AFC four times (1970, 1971, 1973, and 1977). He played in two AFL All-Star games and six AFC-NFC Pro Bowls.